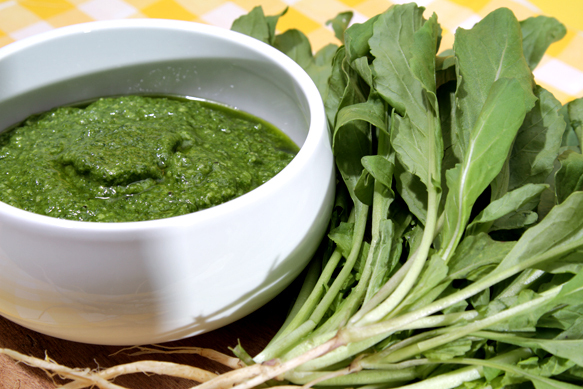 “Arugula is a bit spunky by nature and has a distinct spicy flavor – two things that make it an excellent candidate for a unique pesto,” Viviane says. She recommends using the sauce with pasta, gnocchi, grilled vegetables, fish or chicken, on pizzas, in vinaigrettes, in sandwiches, or as a dipping sauce. Viviane recommends using our Everyday Fresh oil or – my own personal favorite – our robust Miller’s Blend. “I have used both with wonderful results!” she tells us. One last note: You can refrigerate the pesto for up to three days, or freeze it for up to a month.